Coyote Blog » Blog Archive » Where is This? « Will Reality Never Set In? The guy running the crawler must have left his hard hat in the truck that day. I love the fact that they destroyed 99% of the structure. ...but I wish that they'd finished the job! Even more than gutted. As happens when you build a large masonry building on top of a swamp, the the interior walls were well out of plumb and beginning to crack due to unequal settling. 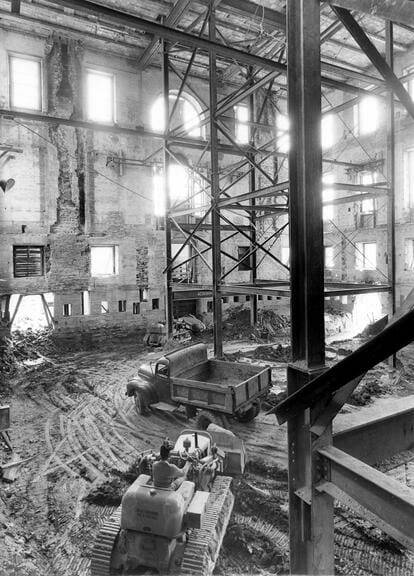 During the 1950s renovation, essentially an entirely new steel-framed building was erected on top of new footings and pilings inside the original masonry shell. Gee, I guess it wasn't The Tank Factory in Stalingrad after all. Obama trying to fundamentally transform the White House? There's a sequence in one of Evelyn Waugh's novels where the bright young things, after a night on the town, repair to a poky Georgian house in Westminster. Turns out it's 10 Downing St, heart of the British Empire. I recall reading long ago that he'd moved into Blair House for this. There is some interesting commentary on the remodel in David McCullough's excellent biography, Truman. They kept the extent of the deterioration quiet and it turned out to be much worse than initially planned for. Photo was taken yesterday. The White House has been empty since January 20, 2009. Future Pic? What the inside of the White House will look like after the last Obama moving van finishes loading on January 20th, 2013. I should have known I would get a quick response from TJIC, for whom pictures of driving a bulldozer through the White House probably constitutes pr0n. During this "restoration" various security measures were built in to the White House including an escape tunnel to the nearby Treasury Department building. There have been persistent rumors that a deep undergroud bunker was built at the same time. The "restoration" was a convenient cover to better protect top administration officials at the beginning of the nuclear era. This isn't really all that uncommon. i've done this to two old buildings now. In one, i rebuilt an entire heavy timber structure inside of it, and just left the old, existing structural masonry in place as a building envelope and veneer. in another I did the same thing, only with steel. it happens all the time. My guess is that these guys didn't think this was special at all except for it was the white house. the building was gutted at the same time the american people were. Nobody really paid income tax before the 50's. Now we are hopelessly paying a fraction of the interest on the money we are loaning ourselves through the federal reserve a wholly owned subsidiary of the rothschild zionist banking empire. They order our treasury to electronically print the zeros and ones on their notes and then charge us for the favor. everyone just gave them over 30,000,000,000,000 dollars recently and we are being rewarded with a zionist police state. If you ever get inside a federal reserve building you will see the same thing. A big empty fake shell. I still have on my DVD a History Channel documentary, dated November 26, 2008, showing the renovation of the Truman White House. GW Bush leads part of the tour.